Benalmádena is a town and municipality in the province of Málaga, part of the autonomous community of Andalusia in southern Spain. The municipality is situated approximately 12 km to the west of the city of Málaga, on the southern coast between Torremolinos and Fuengirola, in the heart of the Costa del Sol and Alhaurín de la Torre in the North. It has a population of approximately 53,000 residents, but also caters for a large number of tourists. 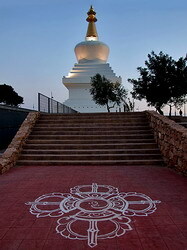 The town is also home to the Enlightenment Stupa, the largest stupa (a structure important in Buddhism) in the West, standing 108 feet (33 m) tall. 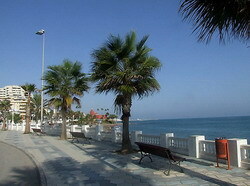 Benalmádena Costa, an urban agglomeration on the coast. Here there are discos, hotels, beaches, shopping centers and an extensively-equipped marina. Tourist attractions include SeaLife aquarium and Selwo Marina, a theme park with dolphins, penguins and seals among other species. The Parque Paloma is a more recent addition to the attractions, a landscaped park containing a large lake and animals running wild. Also featuring an award winning marina with great choice in shops and restaurants. The marina was voted the best in the world by International Property Magazine in 1995. Arroyo de la Miel, originally a separate village, is in the interior between the other two areas. It has become the main residential area, and is also the most commercially active. Buildings are tightly packed and tend to be apartment blocks. It also has several attractions such as the Tivoli World amusement park, and a teleferico (cable car running to the summit of the 769-metre Calamorro mountain, which provides panoramic views of the Sierra Nevada, Gibraltar and on clear days, the Moroccan coastline. Arroyo de la Miel translates as "Stream of Honey" in English. In Arroyo de la Miel, (Avenida Garcia Lorca), is the Costa del Sol's only real ice skating rink together with an indoor swimming pool. 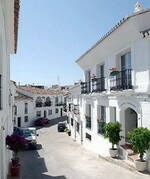 Situated in Benalmadena; Costa del Sol only 8 km away from Malaga Airport and 50 meters away from the beach. Presently modernized. It has up to 210 rooms distributed among seven floors. All exterior. One Kilometer away from the casino and a step away from the Marina Port and leisure centre of Benalmadena costa as well as it's beautiful bays and calm sea. An ideal place to plan your vacation. Situated 50 metres away from the beach and surrounded by beautiful gardens. There are two swimming pools (one for children) and a play area; Large Halls, dining room with pool views, free buffet, wedding salon and meeting room; Two bars, table tennis, darts, etc. The Benalmadena Palace is an Andalusian-style, modern hotel, located just 150 metres from the sandy beach and one kilometre from Parque la Paloma. The hotel offers a number of dining options: the Restaurant Palace serves an extensive buffet of international cuisine for dinner, in a relaxed and informal setting; the snack bar offers light snacks and barbequed food in a relaxing atmosphere, and the disco pub serves a variety of drinks with live music throughout the night. The 182 guestrooms feature light, modern decor in neutral shades with light wood furniture. Kitchens have cookware, dishes, refrigerators and microwaves. 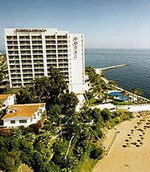 The Best Benalmadena Hotel is located three kilometers from the city center. 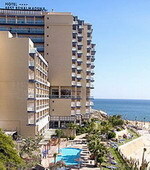 This oceanfront hotel offers extensive facilities, including a hair salon, health club, sauna and two swimming pools. Guests can enjoy a drink at the poolside after a swim in the freshwater swimming pool. The Best Benalmadena Hotel offers a complimentary, buffet breakfast, and dinner each day. Guests can choose international dishes from an extensive hot and cold buffet. The poolside restaurant and bar offers dining in a relaxed setting with ocean views. The Best Benalmadena Hotel features 280 guest rooms, all of which include balconies, mini bars, private bathrooms and complimentary internet access. The Flatotel International is a modern apartment hotel situated next to the Torrequebrada Golf Course in the resort of Benalmadena on the Costa Del Sol, 100 metres from the beach. Guests can lounge on a sun bed by the pool and soak up the Spanish sunshine. After lunch in the air-conditioned restaurant, guests can enjoy a cool drink at the poolside bar before heading down to the beach, 100 metres away. As well as a large buffet restaurant serving international and Mediterranean dishes, the hotel also offers a programme of evening entertainment. Health-conscious guests will appreciate the weight machines and cardio equipment in the onsite gymnasium. The onsite games room features arcade machines, pool and billiards. The Hotel & Apartments La Fonda, built in typical Andalusian-style, features decorative terraces with archways, fountains and hanging plants, and is four kilometers from the beach. Guests can soak up the sun on the tranquil terraces, cool off with a dip in the pool and choose from a selection of drinks and cocktails at the bar. The hotel offers free parking and the 24-hour front desk has a safety deposit box to store valuables. La Fonda Restaurant serves Andalucian and Spanish cuisine on the courtyard patio, encircling a fountain and surrounded by arched colonnades. 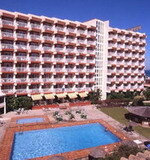 Guests can sunbathe on the beach, four km away; Puerto Marina Harbor, and Torrequebrada Casino are both seven km away. Málaga airport is 15 kilometers from the hotel. Looking out over the Mediterranean, Las Arenas is a modern seafront property located by Santa Ana Beach, one kilometer from Benalmadena Center. The hotel's buffet restaurant is decorated with images of the Andalusian coastline and has an informal atmosphere, serving a range of vegetarian dishes, paella, meat and seafood specialties. The hotel lobby leads to a television room and an inviting bar serving drinks and snacks. 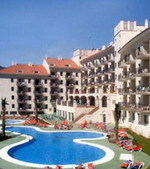 The outdoor pool and separate children's pool are surrounded by a garden and terraces where guests can sunbathe. Parking is available onsite. The restaurants, bars and vibrant nightlife of the Benalmadena center are only one kilometer away, and the bustling city of Malaga, with its museums and shops, is only 20 kilometers away. 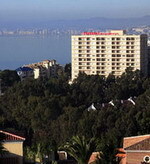 The high-rise, beachfront Torrequebrada Hotel overlooks the Mediterranean Sea on the Costa del Sol, Spain. The popular resorts of Benalmadena and Torremolinos are within five kilometres, and the Torrequebrada Golf Club is a kilometre inland. Tivoli World Theme Park is two kilometres away. Malaga International Airport (Agp), and the town's Picasso Museum, are 12 kilometres from the hotel. The Torrequebrada Hotel offers complimentary breakfast buffet, served in the Pavillon Restaurant overlooking the sea. It also serves international and Mediterranean Lunches surrounded by tropical plants. 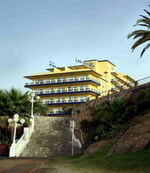 There is a large casino, and the 400-square-metre Spa Torrequebrada includes sauna and hydromassage baths. The Sala Fortuna Cabaret presents international entertainment and flamenco shows.